A Dedicated Team—The Smithsonian is a big organization; Smithsonian Affiliations will help navigate it. Affiliations staff connects partner organizations with resources and opportunities tailored to their needs. Object Loan Assistance—Smithsonian Affiliations helps identify potential object loans from the vast Smithsonian collections and guides Affiliates through the unique loan process at each Smithsonian museum. Smithsonian Programs and Exhibits—Smithsonian Affiliations staff connect Affiliates to Smithsonian scholars, scientists, educators, and authors to lead lectures, workshops, distance learning programs, and more in Affiliate communities. Affiliations staff works to find unique exhibition opportunities for Affiliates. Membership Benefits—Affiliates have the unique opportunity to add an immediate value to the partnership by offering discounted Smithsonian membership to their members. This “two-memberships-in-one” benefit is offered exclusively to Affiliates. Affiliate Reciprocal Membership Benefits are also available, connecting members to the broader Affiliate network. National Promotion—Affiliates have exclusive co-branding opportunities. Only Affiliates may use the Smithsonian Affiliate logo and tagline: “in association with the Smithsonian Institution.” Affiliates and their collaborations are promoted online, through printed publications, and social media. Professional Development— Affiliates enjoy robust professional development opportunities. The annual Smithsonian Affiliations National Conference offers networking, inspiring sessions, and access to Smithsonian and Affiliate colleagues. The Smithsonian Affiliations Visiting Professionals fellowship offers selected candidates a stipend to develop their professional skills during an immersive, hands-on experience. Collaborative Funding— Affiliates have the opportunity to participate in grant partnerships for research and education programs. Special Access—Affiliates may request consultation to facilitate sharing expertise, exhibits, and more. Affiliations staff coordinates behind-the-scenes tours and special access for Affiliate staff and stakeholders. 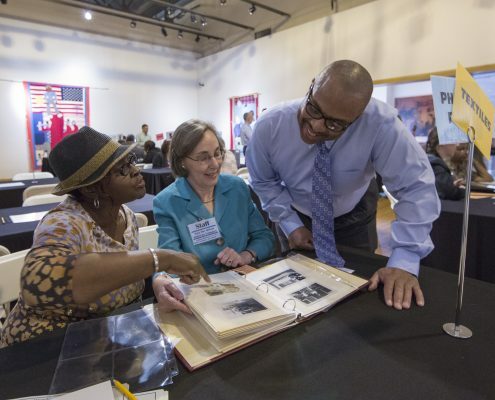 Save our African American Treasures, a program from the National Museum of African American History and Culture, traveled to the Birmingham Civil Rights Institute (Birmingham, AL).